There are two ways for you to exit an orb. Through completion of a successful run. At any time during the run. 1) After a successful run of an Insta-fix, Oracle or Cleansing class orb you will see and hear the following text (Figure 2) once you proceed beyond a critical point. You have made a successful run. Returning you to website download page now. Figure 2 - End of successful run. The orb then shuts down and your web browser opens at the Urthgame.com home page. 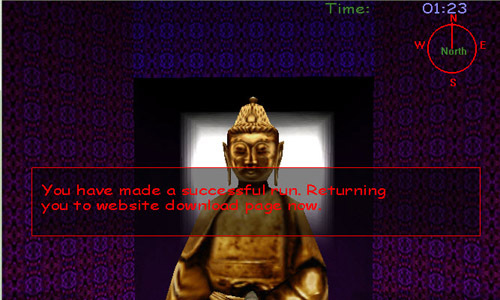 If you continue this direction the level will shut down and take you to the UrthGame.com downloads page. Figure 3 - Remedy exit warning. If you continue moving forward you will see and hear the end of run message shown in Figure 4. The orb then shuts down and your web browser opens at the Urthgame.com home page. Figure 4 - Remedy end of run. Figure 5 - Pressing Esc. 2) If you do not wish to quit, press Esc again, otherwise press the Y key on your keyboard. After you press Y the orb program starts to shut down immediately. 3) Prior to final exit you will see a small window similar to Figure 6. 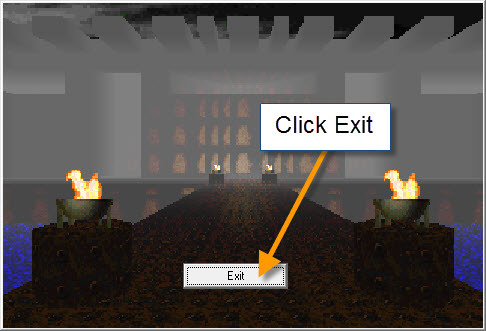 To complete the shutdown, place the cursor on the Exit button and click once with the left mouse button. Figure 6 - Final exit.